Throughout corporate America, many companies have recognized the advantages of having a diverse workforce, but one has been particularly committed to making inclusion a key component of its business model. The financial services firm Morgan Stanley has 57,000 employees in 42 countries, and its Global Head of Diversity and Inclusion, Susan Reid, is a native of Jamaica. In 2016, Reid organized a panel discussion at the company that focused on race in the wake of recent tension-filled interactions between law enforcement and minority communities. More than 1,500 employees participated and Reid said in a statement that it “was one of the most powerful things we’ve done.” These types of gatherings, Reid added, help create more awareness and understanding of others. Morgan Stanley has several Employee Networks to help advance its culture of inclusion, including a Latino Employee Network. It’s co-chaired by Laura LoCosa, Managing Director and Chief Operating Officer of Morgan Stanley Private Bank, who is a long-time employee and one of the firm’s highest-ranking Latinas. Born and raised in Queens, LoCosa joined Morgan Stanley in 1977, starting as a secretary and moving up through a succession of senior leadership and management roles. “The culture keeps me here. 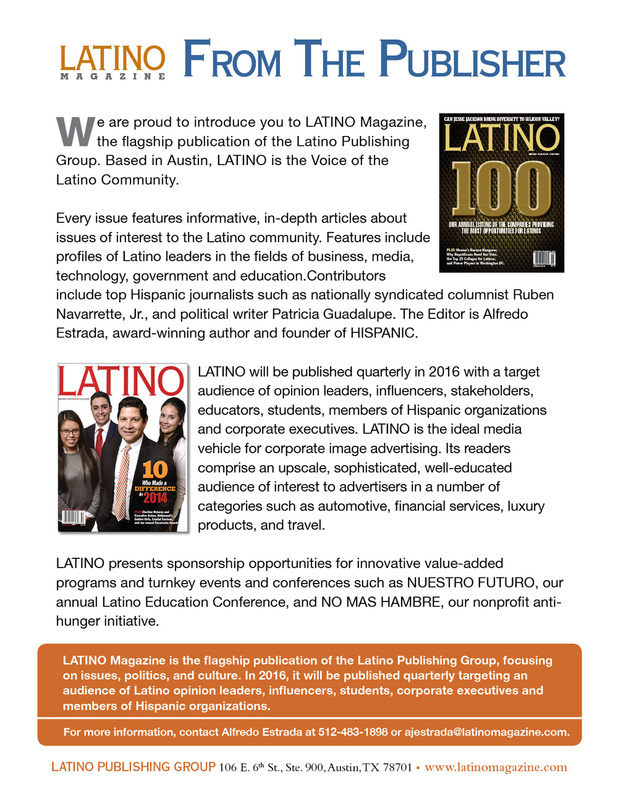 I’ve been able to grow within the company,” LoCosa tells LATINO Magazine. “I’ve had numerous external opportunities presented to me however; have chosen to stay with the firm as those same opportunities existed internally. Why would I leave? Morgan Stanley is a first class organization, you can be your genuine self here, we welcome diversity. As co-chair of the Latino Employee Network, LoCosa understands the importance of diversity: “Our communities are diverse, our clients are diverse, and Morgan Stanley is keeping up. You’re not going to fall into group think when you have a diverse team. The dialogue and solutions are richer and more robust. It’s good business as well as the right thing to do.” LoCosa is also involved with the organization Latino U College Access, which helps first generation college-bound students navigate the system, from enrollment to graduation. “I talk to them about the importance of internships,” LoCosa says, adding that a great many future company employees come from the internship ranks. Morgan Stanley attracts the best and the brightest, says Associate William Zapata, who first joined the company as a Summer Analyst in Investment Banking in 2011. The Bogotá, Colombia native is a graduate of the University of Chicago and is currently in Morgan Stanley’s Investment Banking Division, working in the Global Services Group. “It is an extremely welcoming, inviting experience. Finding the right company to work for from a cultural fit was important to me as I wanted to feel part of a community and I have found that here at Morgan Stanley” Zapata says, adding that diversity is a key factor for him. “It’s important to me that there is diversity around me. It makes the organization stronger. There’s a practicality to diversity. The clients are diverse and they want to see that the team is in tune with them and representative of them”. Zapata adds that Morgan Stanley is doubling down on diversity because it is so important when looking at potential employees: “The question needs to be asked when you’re recruiting candidates, have we done enough to get as wide an audience as possible.” Zapata is also involved outside of the firm with the Hispanic Scholarship Fund, providing students with insight on how to ensure organizations are focused on their skillsets and how they can contribute on the team. Zapata does this by assisting students with resume review and interview preparation. Several years ago, Morgan Stanley launched multiple professional development programs to benefit the firm’s diverse workforce at various levels. In the Multicultural Professional Development Series, African-American and Hispanic Analysts and Associates are offered engaging professional development sessions and interactions with senior leaders focused on careers, commercial thinking, relationships and communications skills.The Leadership Engagement and Development (LEAD) program provides African-American and Hispanic Vice Presidents and Executive Directors focus on development, networking and leadership skills. The Multicultural Leadership Summit for diverse Financial Advisors and Field Managers offers business development, mentoring and networking opportunities.